I was away for most of the day yesterday and left the calves and their mama in the barn where they couldn’t get into much trouble, and where not much trouble could find them. The coyotes have been too active lately, and a couple of small calves would make a nice meal for the pack. 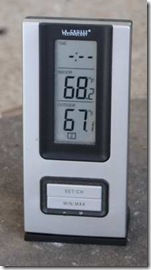 Unfortunately — or fortunately, depending on your point of view — the day turned warm. Really warm. 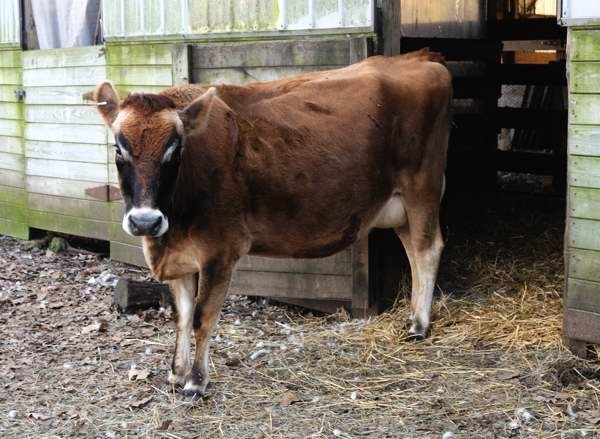 I rode most of the way home with the windows down, and I felt guilty for depriving Rosie, the Jersey cow, and the little ones of the sunshine. So I let them out as soon as I got home. Rosie stepped out first, scoping out the area, checking high and low, making sure the area was safe. 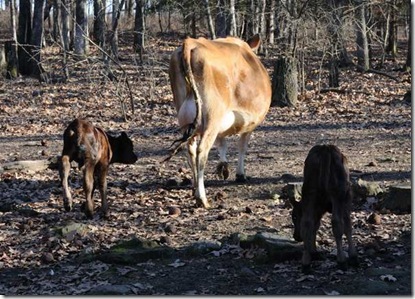 When she was sure all was well, she looked back and called the calves. She used that low, distinctive moo that cows have for young offspring. I love listening to that ‘mother talk’, whether it’s cattle, goats, sheep, or poultry. 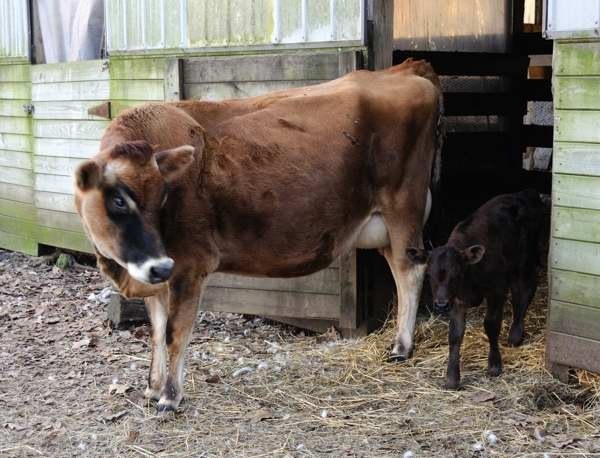 Each of the barnyard species have a special way of speaking to their babies: with a tone, pitch, and rhythm that differs from their regular voices. 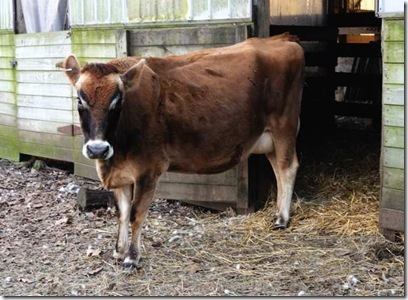 The barnyard mothers also get tired of waiting, and sometimes in exasperation they look to me for help. I guess that’s because I’m generally recognized as the big boss of the barnyard. Or maybe it’s just because I’m there, and the mamas get annoyed at anyone standing idle while they’re doing all the work, feeding the brats, wiping their noses, cleaning up their poo, and trying to teach them manners. Hey, I get it. I’ve been there, done that, raised my own children . . . and you know, I’m done with that. Rosie, you’re on your own. Maybe. Unless I have to wait too long to take these pictures. Finally, young Chuck joined us. Chuck usually isn’t shy, but he’d been napping and apparently was having a hard time waking up and getting moving again. I understand. Naps affect me that way, too. 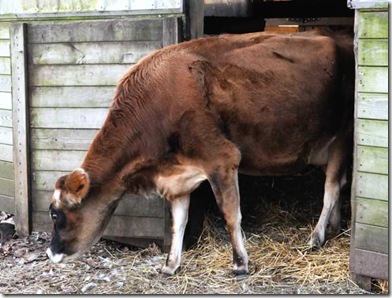 After a bit, Rosie got tired of waiting for the little heifer to join her, so she wandered off, her big udder bouncing around against and between her hind legs. She’s still not used to the new bulk of her udder in full milk, and it takes her a few steps to get the hang of walking right. Chuck just wanted to follow the udder and grab a quick snack. 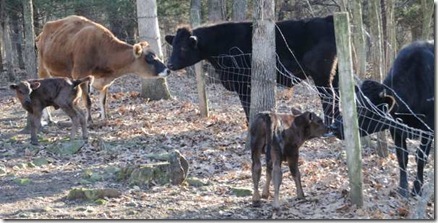 Eventually the little heifer caught up with them, but she seemed more interested in checking out leaves and rocks. While Chuck grabbed a snack, the heifer wandered over toward the fenceline. A few feet away, she turned shy and unsure. That’s understandable, considering how large the other young cattle have grown. The smaller of the black cattle is a full sister to the twins. We never really named her because I didn’t decide until recently whether to keep or sell her. (For now, she’s staying.) 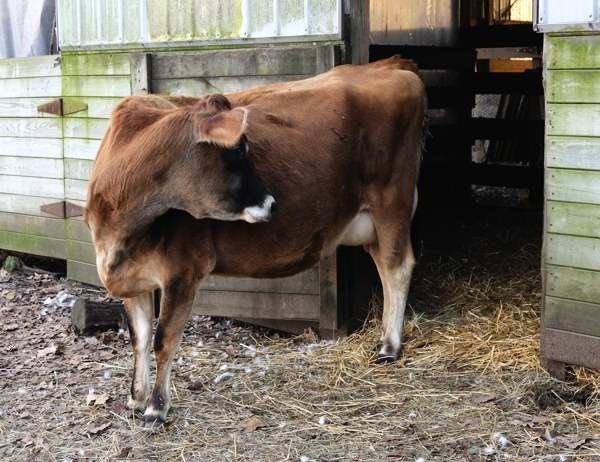 The larger of the two, a steer, is named Steak, which helps us remember not to get too emotionally attached to him. 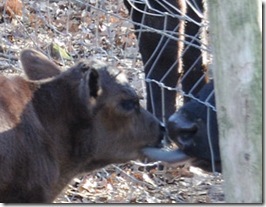 Rosie actually nudged the little heifer closer. I heard a few soft moos of greeting, and then the licking began. 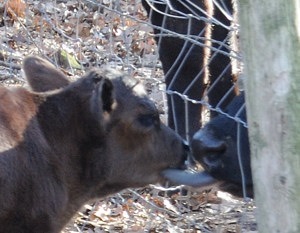 Cattle can be very affectionate. They lick and groom one another a lot within family groups. Rosie apparently includes me in her ‘family’, too, and she’s licked me quite a few times. Earlier this week, when those mothering hormones were kicking in hard but she hadn’t yet given birth, she surprised me with a really nasty, slimy nose nuzzle. Then she wrapped that big, sandpaper-rough tongue around my hand and let me have it. Ick. Ick. Ick. I tried not to do the full, got-the-willies dance because really, it’s an honor to be the recipient of such trust and affection. But seriously. Ick. After a while, the group spread out. Conversations broke out. Gossip was exchanged. 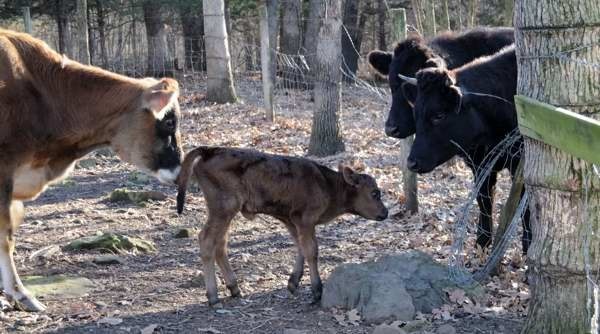 The black ones filled in Rosie on the latest news from the Angus herd on the farm to the east of our place, then added the news from the mixed herd on the farm to the west. . . . Sheesh, again with the licking . . . over on the right. Do you see that tongue? Seriously, what’s up with that tongue? 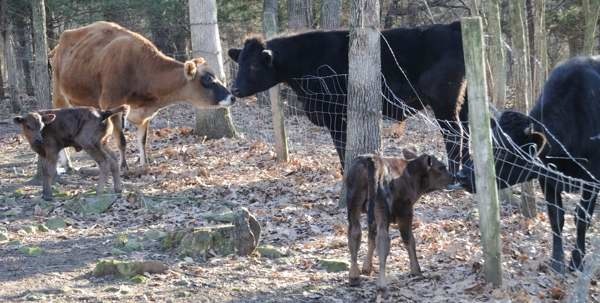 PreviousNew year, new calves . . .
Didn’t realize they introduced their calves that way…too cool. Thanks for sharing.